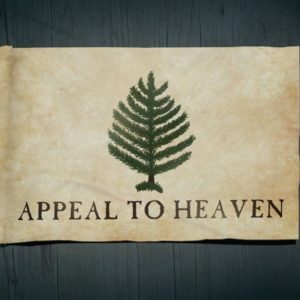 The Appeal to Heaven Flag was one of the “Independence flags” used by the American colonist’s during the American Revolution. The flag was used originally in October 1775 when George Washington acting as commander-in-chief of the Continental Army, commissioned six warships to display the flags during their war with the British. 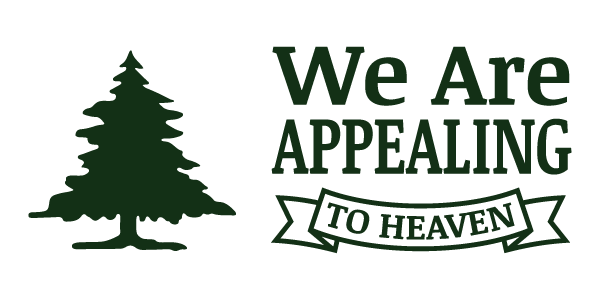 Our Founding Father understood that an “Appeal to Heaven” was the last resort for any oppressed people when all other form of redress of grievances has been exhausted. This principle was also taught by Christ in the Parable of the Persistent Widow found in Luke 18:1-8. America’s Founding Fathers, took this as a slogan after they had realized that years of appeals to the British Government to address their issues had fallen upon deaf ears. The Declaration of Independence made it known to the King of England that they were going over his head. Their appeal now would be to the King of Kings! We, therefore, the Representatives of the united States of America, in General Congress, Assembled, appealing to the Supreme Judge of the world for the [righteousness] of our intentions, do, in the Name, and by Authority of the good People of these Colonies, solemnly publish and declare, That these United Colonies are, and of Right ought to be Free and Independent States. How did a nation of “farmers with pitchforks” defeat the greatest military superpower of the day? Our Founding Fathers cite two reasons. First, their cause was righteous. Second, they firmly believed that their appeal to heaven resulted in God moving on behalf of the newly created American nation. Today’s secularist would have us to believe that God does not exist and that He does not intercede in the affairs of men. The testimony of our Founding Fathers disagrees. On August 1, 1776, Samuel Adams delivered the follow speech at the State House in Philadelphia: “There are instances of, I would say, an almost astonishing providence in our favor; our success has staggered our enemies, and almost given faith to infidels; so we may truly say it is not our own arm which has saved us. The hand of Heaven appears to have led us on to be, perhaps, humble instruments and means in the great providential dispensation which is completing. We have fled from the political Sodom; let us not look back lest we perish and become a monument of infamy and derision to the world. During this time, the Constitutional Convention in 1787, the deliberations were deadlocked, and some of the delegates from New York had even left. Just when things began to look hopeless that the United States would ever have a federal Constitution, Benjamin Franklin stood and addressed George Washington and the other delegates. In the beginning of the contest with Great Britain, when we were sensible of danger, we had daily prayer in this room for our divine protection. Our prayers, Sir, were heard, and they were graciously answered. All of us who were engaged in the struggle must have observed frequent instances of a superintending Providence in our favor. To that kind of Providence, we owe this happy opportunity of consulting in peace on the means of establishing our future national [happiness]. And have we now forgotten this powerful friend? Or do we imagine we no longer need His assistance? I have lived, Sir, a long time, and the longer I live, the more convincing proofs I see of this truth— that God governs in the affairs of men. And if a sparrow cannot fall to the ground without His notice, is it probable that an empire cannot rise without His aid? We have been assured, Sir, in the sacred writings, that “except the Lord build the house, they labor in vain that build it.” I firmly believe this; and I also believe that without His concurring aid, we shall succeed in this political building no better than the builders of Babel… I therefore beg leave to move—that henceforth prayers imploring the assistance of heaven, and its blessing on our deliberations, be held in this assembly every morning before we proceed to business, and that one or more of the clergy of this city be requested to officiate in that service. When an objective and unbiased individual reads Mr. Franklin’s speech on the floor of the Constitutional Convention, one cannot help but acknowledge many truths about Mr. Franklin, his faith and the role he felt that God and Christianity should play in the affairs of government. He felt it was perfectly acceptable for government officials, as part of their official duties, to pray and ask God for divine guidance, direction, favor and protection for their nation. He believed in a personal God who not only heard their prayers, but also answered them. He believed God had personally intervened in the war and had shown favor to the colonists’ cause. He asked the questions, “And have we now forgotten this powerful friend? Or do we imagine we no longer need His assistance?” Mr. Franklin was aware of the tendency of man to forget God and think that we no longer need His assistance. America is presently in the midst of serious political, social, moral and political trouble. The situation appears to be so grave that the American people need to once again ask ourselves: “Have we now forgotten this powerful friend? Or do we imagine we no longer need His assistance? It is for these reasons that the American Christian Leadership Alliance has adopted the “Appeal to Heaven” symbol and slogan for the next civil rights movement.